We really enjoyed your vacation, and have the following comments. 2 ----Meals in Beijing, Shanghai and Xian very good. The meal at the Hyatt on arrival in Xian was the best! 3--- The guides were all good. All guides were knowledgable, however it would help the tourists if the guides could advise us about points of interest on the journey to our destination. 4----All drivers were very good and the buses were spotless. 5----Robyn Self became ill in Tiananmen Square and our guide Ray was extremely helpful in arranging an ambulance to take Robyn to the hospital, where we were met by two staff from Travel China Guide. We could not have received service as good as this in Australia, and we would sincerely like to thank Ray and the two young ladies for their assistance. Within 15 minutes of arrival, Robyn had been seen a doctor, and was in a room with a drip inserted. Then back to the hotel, and was ready to resume the tour the next day. Firstly let me say we could not have had a better company for our first adventure to your country, it was wonderful, in fact all personnel that we have had contact with in your company, including yourselves have been highly professional, extremely helpful and obliging. Our guide in Beijing, David Lixuyang and driver Yan Jun Bao were excellent and although we didn't spend may hours is Xian the guide Maggie and Mr. Cheng the driver were also very professional. David and Yan were wonderful, David's knowledge on your country's history and his English is very very good, he is a excellent communicator. Jan is also a patient and efficient driver, considering your traffic, and his vehicle was always pristine. In regards to the meals, my husband who is usually not very adventurous in trying new types of food ate everything placed in front of him. After 2 months of travelling unfortunately I cannot remember if one particular meal stands out but I do know we enjoyed all the meals and were totally satisfied with the service in all the restaurants as well. Finally, we intend in a few years to returning to China for a more extensive look at your beautiful country and will not hesitate to book a tour with your company, TravelChina Guide. It was nice to meet you face to face in Xian. We were very happy with our 25-day luxury tailor made tour to China. It truly exceeded our expectations. 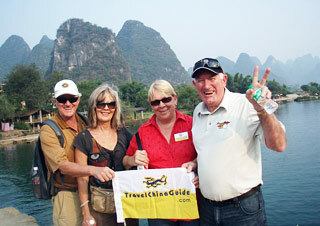 The organisation and arrangements made by Travel China Guide are second to none. At each location, our guide and driver were always waiting to greet us wherever we arrived at an airport or railway station. We had heard that travel on Chinese trains could be difficult, but even this proved simple and straightforward with TravelChinaGuide's close attention to every detailed aspect of our trip. We felt there was a nice balance between seeing the traditional tourist sites, discussing Chinese history and culture with our guides, enjoying Chinese food and hospitality, and going to see a show on some of the evenings. All the guides and drivers were very courteous and helpful and treated us like personal friends rather than as paying clients. 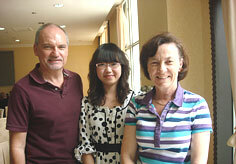 They all spoke very good English and at no time did we have any difficulty understanding them. We asked many questions and the guides were genuinely happy to answer them all. All guides demonstrated a good knowledge of Chinese history and culture and handled all our questions with apparent ease. We were particularly pleased to have a Naxi guide in Lijiang and a Bai guide in Dali as this enabled us to gain a more detailed knowledge of the minority cultures in China. Although driving in China is a very different experience from that in the West, at all times we felt completely safe with our drivers. We were also extremely thankful that we were not having to worry about driving ourselves. All the hotels were of an excellent standard, extremely comfortable and particularly well located. The food was very good throughout and the guides checked our preferences before ordering for us. Our only negative comment would be that we were offered too much food at lunchtime. We are used to having only a snack at lunch time. We enjoyed the shows that were organised for us and they helped us to gain a broader appreciation of Chinese Culture. The highlights were not surprisingly the Tang Dynasty Show in Xian and The Acrobatic Show in Shanghai. Our guide in Kunming suggested that we attended an ethnic dance show in Kunming and this was a wonderful mix of raw power from the men and beauty and grace from the female dancers. 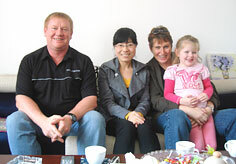 We really enjoyed the visits to the Chinese families in the different locations. It added greatly to the tour and it was an interesting experience that we had not encountered on any of our trips to other countries. At all times, we found the Chinese people extremely helpful, and if on our free days we consulted a map, we could rely on someone approaching us and offering to direct us to our destination. The meals we enjoyed the most were the buffets offered by some of the hotels at dinner time. The buffet dinner in the Hyatt Regency Hotel in Xian and the Landison Plaza, Hangzhou were particularly good. We were cautious about eating seafood and avoided it until we got to Guilin, Shanghai and Hangzhou where the seafood was outstanding. The dinner that accompanied the Tang Dynasty Show was also excellent. Monica was very knowledgeable about the places we visited and told us many interesting facts about the Terracotta Army, some of which would only be known by someone with a very detailed knowledge of the exhibits. She also gave us a great deal of information about the exhibits in the Xian Provincial History Museum and the Mausoleum of Western Han Emperor Liu Qi. The latter really surprised us with its exhibits. Since we returned, Monica has been in touch with us by e-mail as she offered to send us the e-mail address of the lady we visited in Xian. We intend to send her the photographs we took in her appartment. 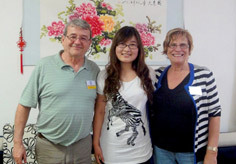 We had a lot of fun with Monica and the driver we nicknamed Jackie Chan and we very much enjoyed their company. The car was always clean and tidy both inside and out. In summary, we were very happy with Monica and Jackie and want to dispel any concerns you think you have picked up from our comments. It is difficult to single out any guides, when the overall standard was so high, but probably Sara in Beijing and Fiona in Kunming stand out as going well beyond the call of duty. Having said that we were also serenaded by Charity during a boat trip in Suzhou ! You should anticipate from our responses, that we really enjoyed our trip to China and our heartfelt thanks go to all those from TravelChinaGuide, who contributed to a truly memorable and enjoyable holiday. 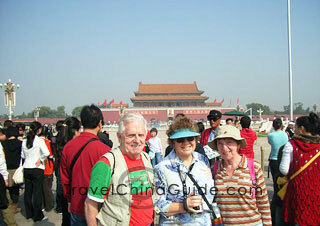 We would not hesitate to recommend TravelChinaGuide to anyone contemplating a visit to China. We may well return to China ourselves in a few years time and if we do we will contact you again. On a completely different point, it might be worth mentioning on your website that if you wish to make use of some of the hotel swimming pools, you are required to wear a swimming cap. This is not a requirement in hotels in the West. Well that is all for now. I will give you access to a selection of my photographs when I have finally processed them all. Please contact me if there is anything else you would like to know. We enjoyed our tour tremendously. From the driver and tour guide to the hotel, food, and tours. 1. We enjoyed all the meals. The children and my husband really enjoyed the Peking Duck, even my son who is very picky. 2. Our guide (Cindy) was very good. Good knowledge of the tours and her English was very good. 3. Driver (Mr. Wang) was also very good. Always there ready to pick us up and always had water for us. Car was clean and comfortable. Again, we really enjoyed our tour and have already recommended your travel guide to other friends. Thank you again for a very enjoyable trip. We were very happy with the service provided during the duration of our tour. Our guide, Kevin, was very patient and accommodating. His English is excellent and he was always flexible with the schedule and open to our requests. Before we reached the second hotel, he even took the intiative to ask for a baby cot for our hotel room, after he'd heard that we'd asked for one in the first hotel. The driver was also very good. He did not speed, was very helpful with the luggage and his attitude was always friendly. The meals were all very good, except that there was a bit too much food most of the time. I think our favorite meal was in Dejuyuan in Pingyao. Finally, thank you for your efficient service in answering our questions and booking the tour. It was a very enjoyable holiday.